We all want our lives to be exciting, but we need them to be rooted in reliability. Sometimes things go awry, and that one thing we rely on as our primary mode of transportation stops working. It is no fun dealing with car problems and can be even more of a pain to try and figure out what exactly is wrong with your engine or whatever else. However, you don’t have to frustrate yourself unneccesarily. A good automotive digital multimeter is a must have for anyone with a car. However, not all multimeters are made equally. For the best possible results, you want to use the best possible automotive multimeter possible. The Innova 3340 is a quality automotive digital multimeter for anyone for is having problems with their vehicle’s performance, as well as any electrical problems that might be happening around your house. There might not be a perfect automotive multimeter, but the Innova 3340 might very well be the very best of them all. 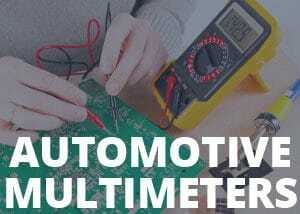 What makes this the best automotive multimeter? It’s not just one big thing, but rather a whole lot of small things that add up to ensure a high quality performance. The Innova 3340 is certified for safety under the UL. It is handheld, weighing only one pound with dimensions of 12.5 by 4.5 by 6.5 inches. It also comes with trilingual instructions, offering directions in English, Spanish and French. The value of these components will come to light each time you operate this multimeter. Every time you use the Innova 3340, you are more and more likely to realize the vast potential of this amazing device. Users can operate this multimeter in a variety of ways. It addition to being handheld, it also comes with a wrist strap and a stand for hands-free use. While testing the engine for problems, the 10 MegOhm circuitry helps to ensure that the ECU (engine control unit) will not be damaged in the process. The Innova 3340 is the best automotive multimeter, s it not only looks out for itself, but also for the integrity of your vehicle or any vehicles you may be working on. Another aspect that makes this the best digital multimeter is how thoroughly it covers all the bases necessary for your vehicle. The Innova 3340 is able to test a wide variety of components of a vehicle, including, but not limited to, the alternator diodes, duty cycle, solenoids, breaker points, wiring and switches. Be sure to educate yourself properly on the functions of each of these components. When you use the Innova 3340, it keeps track of your information by letting you save your data for future usage. The Min/Max and Hold buttons allow you to keep the valuable information from the tests you perform so you don’t have to waste your time with unnecessary re-testing of components in the event of interruption. Through the autoranging feature this multimeter will determine the range of value specific for the electrical issues your vehicle or other electrical device is facing. This prevents you from having to deal with the preset ranges of typical multimeters. The Innova 3340 protects against reverse polarity, meaning it will greatly reduce a possible hazard of being shocked while working on your vehicle or electrical outlets. The Innova 3340 multimeter will provide temperatures in both Fahrenheit and Celsius measurements, meaning those with an inclination towards either system of measurement (and most of us do have a specific preference) can be satisfied with this product. The Innova 3340 multimeter has features which help ensure it functions to its full capacity and does not wear out. Included in this multimeter are an auto shut-off feature as well as over-load protection. As the best digital multimeter, the Innova 3340 can be guaranteed to last. The Innova 3340 comes with a built-in stand and wrist straps which allow for ideal hands-free use for anyone wanting as much flexibility as possible when working on their vehicle or home electrical systems. The Innova 3340 is great for its wide range of use. If you are an experienced mechanic, this multimeter will streamline procedures which will make it all the easier to operate on vehicles in the most efficient way possible. If you are new to vehicle repair, this, and other multimeters in the Innova family are ideal for first-time use. However, make sure to read the instructions carefully and do not do anything not specifically recommended by the manual. If you are using the Innova 3340, follow each step directly and carefully. Should you reach any point in the instructions that is unclear or that you do not feel confident performing, consult a properly trained and certified mechanic. It might be the best digital multimeter, but you need to use your best judgement to ensure no preventable accidents occur while operating it. While it is an expertly-designed and easy to use multimeter, the Innova 3340 still has a few minor shortcomings. The RPM reader was not as consistent as we would have liked. Therefore, you might need to test the RPM reading several times for the best possible accuracy. The screen of the multimeter is also somewhat dimmed and might require an additional light source in order for uses to probably operate it. Additionally, temperature probe was found to be inconsistent as well. Does this multimeter run on batteries. If so, where are they? Yes, the Innova 3340 runs on batteries. There is a compartment on the back of the device which can be opened with a screwdriver. What sort of batteries do I need? The Innova 3340 requires two 1.5v AA batteries to function. How will I know when I need to replace the batteries? When the batteries are low for the Innova 3340, a low battery symbol will appear. How soon does the auto shut-off feature activate? After ten minutes of non-use, the Innova 3340 will automatically shut off. Buyer satisfaction is very high amongst users of the Innova 3340 multimeter. On Amazon, the average rating is 4.5 stars and an overwhelmingly majority of users have given it a five-star rating. Users have praised this automotive multimeter for its wide range of features, durability and value for its price. It has a strong consensus of approval from those new to automotive repair and those who have years of experience with it. It’s simple design and easy to understand instructions are part of the wide appeal of this multimeter. The Innova 3340 might be the best automotive multimeter and electric multimeter/voltage meter you have ever come across. Whether you are a professional mechanic, facing problems with your own vehicle, or want to be prepared in case of any worst case scenario situations with your vehicle (or electrical devices), we strongly urge to purchase the Innova 3340. It is the most sophisticated yet of the quality line of multimeters in the Innova family. For a valuable and durable automotive digital multimeter, look no further than the Innova 3340. This is a digital multimeter you can be happy with. Make sure that you follow the instructions carefully and consistently. Should you have any questions, be sure to contact Innova’s customer service department. Support is offered between Monday and Friday, from 6 a.m. to 6 p.m. Pacific Time in both English and Spanish. If your problem is not resolved successfully, be sure to consult with a well-trained mechanic. We hope that you are completely satisfied with the Innova 3340 and recommend it to your friends and colleagues as a quality multimeter. Make sure that you follow the instructions carefully and consistently. Should you have any questions, be sure to contact Innova’s customer service department. Support is offered between Monday and Friday, from 6 a.m. to 6 p.m. Pacific Time in both English and Spanish. If your problem is not resolved successfully, be sure to consult with a well-trained mechanic. Follow any warnings about hazards and misuse that the instructional manual mentions. We hope that you are completely satisfied with the Innova 3340 and recommend it to your friends and colleagues as a quality multimeter. Follow any warnings about hazards and misuse that the instructional manual mentions.